Check out this beautiful custom home in Beautiful Bella Vista, Arkansas! 3 BR/2.5 Baths on large wooded lot. Backyard has nice deck and hot tub. Bamboo flooring, tall ceilings, safe room and much more. 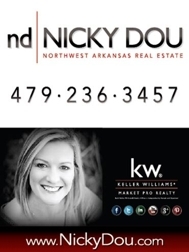 Call Nicky Dou to see this home for yourself. 479.236.3457 or visit www.NickyDou.com for more info. on homes for sale in Bella Vista or anywhere in Northwest Arkansas!